Create the ultimate indoor garden for plants or collectables by adding a vinyl garden window to any room. 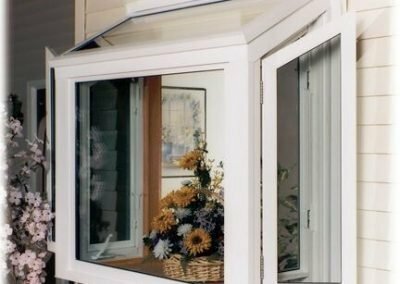 The custom made nature of Bristol vinyl garden windows makes them a perfect addition to an area where there was once no window. QUALITY HARDWARE – Operational ease every time. BIRCH or OAK VENEER over 1-1/4 PLYWOOD – Accepts stains or paint. PROJECTION – Ample room for plants and decorative items. DOUBLE LOCKS and SCREENS ARE STANDARD – Maximum security and ventilation. FUSION-WELDED ONE-PIECE SASH – Stability and beauty while eliminating draft. 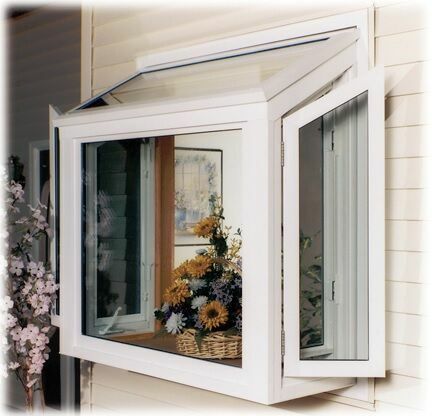 3 PANES OF GLASS – Strength and maximum insulating air space. Two LAYERS OF HEAT REFLECTIVE LOW-E – Turns reg. glass into smart glass. Holds heat during the winter, reflects it in the summer. Add light & reduce unwanted solar glare and damaging rays. Easy cleaning – Casement end vents open a full 900. CUSTOM-MADE – Always built to your specifications. VINYL CLAD ALUMINUM FRAME – Beauty and Strength for a lifetime. COLORS THAT COMPLIMENT – White, Beige, Brown or Woodgrain INTERIOR. White EXTERIOR.